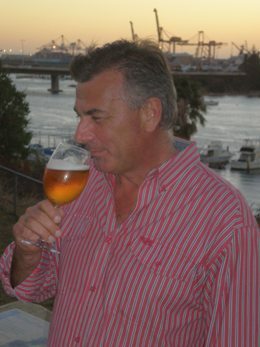 This week my guest is Pat Hollingdale from BIABrewer.info – one of the early brewers who helped develop the BIAB technique in Australia. Pat introduces BIAB brewing which involves doing the mash over heat in the main boiler using a full boil mash and then lautering with a simple grain bag. He talks about the equipment to get started – nothing more than a full boil pot (about 9 gallons for a 5 gallon batch) and a large polyester grain bag. Pat discusses the very high water to grain ratio used (essentially the full boil volume plus more is used for the mash) and how that does not necessarily hurt the efficiency of the mash or lead to off flavors. Pat discusses some of the advantages of BIAB – including lower cost of equipment (its all done from a single boiler) and less cleanup. Thanks again to Pat Hollingdale for getting up early and agreeing to do the interview! Just to clarify Max Cooper introduced a Homebrew wort kit in 1976 called Brewers Own that was 15 litres of wort that was packaged in a bag in box but in 1984 Coopers installed vacuum evaporators from Alpha Laval to make the Homebrew Concentrates and Malt Extract mainly for the export market . I know many early brewers here in the states started in the 1970’s and of course before that people brewed at home routinely for centuries using a wide variety of techniques and equipment. I appreciate the feedback! In the US Pabst and Budwieser also made Hop Flavored Malt Extract during prohibition that must of been used for hop flavored cookies 😉 and its still made today by Premier Malt .I think their Hopped extract is used by Mr Beer . I appreciate the update – always interesting to discuss the history of homebrewing. Good Day, I haved brewed Full Volume BIAB for over two years in middle south Tennessee. One big difference with full volume BIAB, and normal 3V brewing is the mash hold temperaure. BIAB will turn out much dryer/more fermentable in the low 140F range, and much more malty in the High 150F range, than 3v ever could. The best balance is still 152F, just as 3V has always had. The best benifit is with ONE kettle, with a bag, on a heater, allows very simple STEP mashing. Turn the heat on and off for every step desired. An interesting observation – I’m not sure why it would be drier or more malty on either end, except to look at the very high water to grain ratio used when mashing. I know (for example) that German triple decoctions done at high water to grain ratios do result in a maltier finish than a single infusion. Thanks for sharing your findings there Steve, that’s all quite interesting to hear. AFAIK, there’s not been much research done (or at least made public) that has objective data and can be used as a direct comparison between BIAB as we know it today and other methods, so it is difficult for me to comment one way or another, but I think that brewers will continue to fine tune their own equipment to progressively obtain particular effects. I would say though that BIAB’s high L:G doesn’t seem to have the negative effects which some critics hypothesise will compromise or ruin the beer (one I know of is a professional brewer), and in fact it may enable manipulation of some characteristics, as Brad relates and you’ve found for yourself. What we’ve found is that in using just the one vessel for mashing, lautering and boiling, BIAB is really quite attractive to novices hoping to try an all- grain method for the first time. Initially they are faced with a bewildering array of conventional equipment, some of it quite expensive too, which may or may not provide the desired results. That’s quite a big risk to accept just to try all- grain, and then the brewer may not like either the process or the end result. However, with just the one kettle and heat source (even a domestic stovetop in the kitchen, that’s all I use) the BIAB method is really phenomenally low risk (eg. my home brewery AG conversion cost me just A$20 for the stockpot and a few dollars more for the bag material), and as Pat related during the interview, there’s no real negatives, limitations or down- sides in continuing to BIAB in the long term. Competitive results indicate there aren’t compromises to the quality of the final product either, so BIAB really is a ‘win- win’ situation. BTW, many thanks Brad and Pat for an interesting and helpful interview! Well…I tried BIAB this weekend, and what a great process, very simple. I used the calculator from biab.org, but I wasn’t too sure about scaling the recipe. Now that I’ve brewed and found my SG to be a bit lower than calculated, I imagine that was the result of not scaling. Great podcast, keep them coming. I’m working with Pat and others to get BIAB mash profiles integrated into the next version. I’ve been researching my next brew and i was thinking of an all-grain brew. My question is do I have to have a mash tun or can I do a biab for the first time. In the middle of my First Brew in a Bag and wanted to know when it’s finish cooled down, then you add the yeast, do you put sugar or dextose to make the yeast work like the canned brew? I first did this brewing in a bag in 1994 on my own initiative because I did not know about mash tuns. So it looks like it didn’t start in Australia.